The inaugural conference of the Maria Sibylla Merian Institute for Advanced Studies in Africa (MIASA) took place in Accra, the capital of Ghana, at the end of September 2018. The new institute will be a meeting place for researchers from Germany, Africa and throughout the world to study the subject of ‘sustainable government’. The initial phase is being funded by the Federal Ministry of Education and Research (BMBF), and many renowned institutions are involved in MIASA. Coordination is managed by the Freiburg Institute for Advanced Studies (FRIAS) and the Arnold Bergstraesser Institute (ABI). 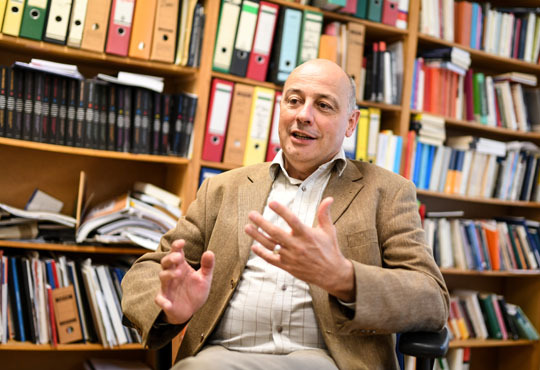 Mathias Heybrock talked to ABI Director Prof. Dr. Andreas Mehler about his impressions of Accra. Mr Mehler, you’ve just returned from the inaugural MIASA conference. How did it go? Andreas Mehler: Very well. Encouraging! This conference gave us the opportunity to present our research strategy to the public. And when you also have the right people, and we did, it’s a profound venture. So who spoke at the conference? Well, Francis Nyamnjoh, for example, who holds the most important African chair of Ethnology. He spoke on ‘Incompleteness’. This is still often an unusual idea for academics – everyone thinks they are the center of the world. But Nyamnjoh believes that only through cooperation is one complete. And that is the heart of our agenda: to create a different form of cooperation between Germany and Africa than we’ve previously had. The impetus and the money would come from the North, usually the concept too. And then you’d look for a local partner that you could do it together with. Of course, everyone talks about equality and indeed really wants it. But with a model like this it just isn’t possible – the imbalance is simply too great. Are these the asymmetries that MIASA aims to resolve? There were asymmetries at many levels and there still are. Sometimes the African side doesn’t even make much effort to demand equality. 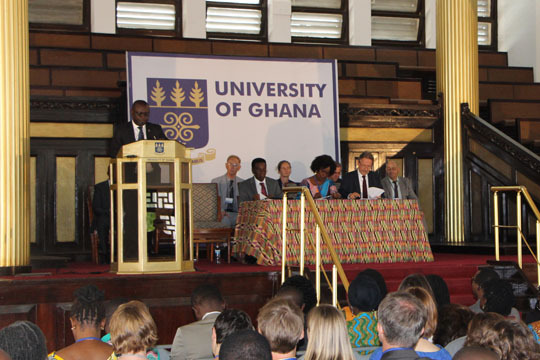 Our enthusiasm for the University of Ghana also stems from the fact that it wants to be equal. The university very deliberately formulated its objectives. It has clearly stated that it really wants the institution – including after the initial period of funding from the BMBF. Therefore it’s taken on a fairly complicated bureaucratic task, to transform MIASA into a full institution of the University of Ghana. That means we aren’t just a temporary ‘project’ there. Why is MIASA in Ghana? Firstly, because the university really wanted this institution – but the government did too. You could see it from the agenda of the inaugural conference: All the key people were there and gave speeches, right up to the Minister of Higher Education. Can you describe Ghana in just a few words? Ghana is a democracy, the country has shown that with elections and repeated changes of office. That was another reason for us to go there: the freedom to teach and research is guaranteed. The security situation is also good – we wanted to have a clear conscience about sending researchers there. And: we also have to offer these academics something. An institution like this is of course in global competition. So, what does Ghana offer? The University of Ghana has very good facilities, for instance a Centre for Migration Studies that we work closely with. And migration is one of the key issues of the day – not just for us, but for Africa too. Amongst other things, because Africa is itself affected by migration: most people migrate within Africa, only a small share comes to Europe. Long before what we have experienced as a migration crisis since 2015, researchers at the University of Ghana were reflecting on migration. From January 2019, a group of research scholarship holders will be studying this subject at MIASA. What’s Germany’s interest in an institution like this? Networking with top international talent, honor and reputation too, which will make us even more attractive in future for other partners. Naturally, at first glance it’s about elite advancement. Well, we’re also working more broadly. MIASA fellows will give public lectures, advise doctoral and PhD students. They will have an impact on the University of Ghana. I think that’s extremely important: that there is an exchange there. It will be extremely useful to us. Until now, I would describe our approach as somewhat limited. For instance, many people think it’s enough to give an African politician money so that he can ‘stop’ migration. But you have to look more closely, at local circumstances, local stakeholders. What do you expect from this? I’m almost glad when we from the North get the occasional slap in the face, to shake us out of our assurance. It only fuels the search for shared solutions that really bear fruit. And that’s the goal of the institution. With the Maria Sibylla Merian Centres’ international research colleges, the Federal Ministry for Education and Research (BMBF) aims to promote the internationalization of humanities, cultural and social sciences in Germany through close bilateral and multilateral cooperation projects at sites outside Germany. In regions and partner countries in Asia, Latin America and Africa that are important to academic and science policy, colleges are being created where a group of academics from Germany and the host country will research jointly into humanities and social science issues and regularly invite fellows. The colleges are being set up and run in partner with German scientific institutions. The German partners of MIASA are the University of Freiburg with FRIAS and the ABI, the German Historical Institute Paris as a member of the Max Weber Foundation, the German Institute of Global and Area Studies (GIGA) in Hamburg, the University of Konstanz and the Centre for Interdisciplinary African Studies (ZIAF) at the University of Frankfurt. The BMBF is initially providing the center with 1.7 million euros funding for a preparatory phase until the end of 2020. For the planned twelve years funding period, total funding will amount to 18 million euros.